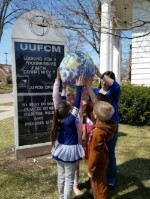 Keep up on all the goings on at the UUFCM! Our month-long worship exploration of what it means to be a people of emergence will conclude this Sunday, April 29, with a message from our minister titled “Born and Reborn” – we hope you will join us! May 2018 Worship Theme: What Does It Mean to Be a People of Creativity? Thursday, April 26th there is an opportunity to view Nor Any Drop to Drink, a documentary about the Flint water crisis. The documentary written and directed by Dr. Cedric Taylor (Department of Sociology, Anthropology and Social Work, CMU) is based on interviews with Flint residents and with the people involved in uncovering the crisis. This truly eye-opening and insightful experience starts at 7:00 pm on April 26 on campus in Anspach 161 (between Broomfield and Preston). The Poor People's Campaign - A National Call for Moral Revival - is set to commence on May 13. To participate in any of the PPC’s "Direct Action Mondays," that will begin on May 14, please fill out the online training and organizing form to sign up for an action training session and see the schedule for direct action campaign events. The PPC’s “Direct Action Mondays” are an opportunity to participate in civil disobedience at their state capitols. Specific themes to be focused on include women and children in poverty, systemic racism, voting rights, just immigration, the war economy, ecological devastation, and living wages. 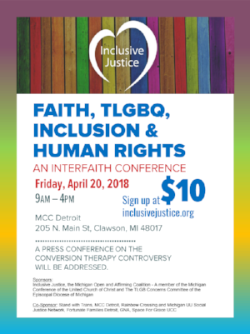 If you are interested in learning more about the Poor People’s Campaign, you can visit the Michigan Campaign's Facebook page for more information, or the Poor People's Campaign website. This orientation is geared to newcomers, visitors, and those seeking to learn more about Unitarian Universalism and this UU fellowship. It is offered every month on the fourth Sunday at 12:15 p.m. Sessions are approximately ninety minutes. This is the first in a series of three steps to membership at the UUFCM. For complete information, please visit our website at uufcm.org/membership. The last Young Adult Potluck of the semester will be held on Sunday, April 29, at 6:00 pm in the Social Hall. This potluck will provide a break from studying for finals and a chance to eat good food and say so long for the summer. The fellowship will provide a main dish and beverages; all others may bring a dish to pass. But if you're short on time or energy to bring something - don't worry! Please come anyway. Join us for our May First Friday communal nosh! Stacey Pattison is hosting. We will also be celebrating the birthdays of Roze Bentley, Dan O'Brien, Scott Daigle, Cynthia Damer, Susan Powers, Kate Swier, Larry Hall, Stacy Guthrie, and Mary Alsager. The potluck begins at 6:30 p.m. - helping hands are welcome at 6:15 p.m. to assist with set-up preparations. CCN (Community Compassionate Network) with memo “Infant Pantry.” Please contact Tom Moffit ​(989-772-1602; moffi1tc@cmich.edu) with questions. Beltane is a time to celebrate fertility and the greening of the earth, to honor the arrival of spring and new life. Covenant of UU Pagans invites those of you who are interested in participating in this ritual to bring an item of food or drink to share at the potluck that follows the ceremony. We will gather at 6:30 pm and begin our ceremony promptly at 7:00 pm. Please be mindful that any beverages carried into the sanctuary need to be in a travel mug/container with a secure lid or cap. As careful as we are, too many spills are taking place in that space. We appreciate your cooperation in this. The UUFCM Board recently established a Safety Task Force to assist us in developing policy and procedures for safety measures needed in the event of dangerous circumstances that may result via nature and/or human intent. Be aware that as we work to become a more safety-conscious congregation, you will be seeing some changes to help make us safer from fire, tornados, and potential assailants. Please take the time to read the article “Sunday Security” on page 40 in the Spring 2018 issue of UU World magazine. It explains how the UUA and individual congregations are becoming more safety proactive. ICYMI - Slimeapalooza and Egg hunt photos are on our website! This month our RE classes are talking about and doing activities together that help us explore the question of what it means to be a people of emergence. Our themes in RE each month are in concert with what the grown-ups are exploring together in worship...so all of us are sharing together in our learning. If you would like your child to attend but have difficulty getting them to church on Sundays - please let us know! Come join us for this fun community event! Whatever your pace, we have the walk for you. Choose from a one-mile or two-mile route. Both begin at Island Park and lead through the beautiful city parks of Mt. Pleasant. we just need help learning how not to run away. e-News is Tuesday at 5:00 p.m. In case of inclement weather, a decision to cancel the service will be made by 9 a.m. There are multiple ways to learn the status of a Sunday service in our snowy months. Members and friends may request to join the ​Remind app and receive cancellation news via a text or email. In addition, an announcement will be posted on Facebook ​as well as sent directly via email. Those who are not online will be phoned. If you have questions, call Laura McBride (989-772-5512). We hope we won't have to resort to this very often, but we live in Michigan after all, so we need to be prepared! I’ve been seeking my whole life long. Laura McBride is willing to conduct the Path to Membership class on Saturday, April 21st from 1-4 pm. Please let her know if this works! Her contact information is Lmcbride010@gmail.com or 989.772.5512. Stewardship Sunday – Earth Day Festival!!! Our worship service this Sunday, April 22, is the main event for this “Stewardship Sunday – Earth Day Festival!” Please join us as we kick off our celebration with a special message from our guest speaker, MUUSJN’s own Jennifer Teed, a stewardship reflection from Kevin Daum, plus wonderful music offerings from our Joyful Noise choir! ICYMI - Slimeapalooza and Egg hunt photos are now available! The day widened, pulled from both ends by the shrinking dark, as if darkness itself were a pair of hands and daylight a skein between them, a flexible membrane, and the hands that had pressed together all winter — praying, paralyzed with foreboding — now flung wide open. This Sunday, April 15, we continue our exploration of what it means to be a people of emergence with a message from our minister titled “What Emerges When We Choose to Bless the World” – please plan to join us! April 2018 Worship Theme: What Does It Mean to Be a People of Emergence? This workshop is designed for those who are ready to make the membership commitment to UUFCM. In this interactive session we explore the deeper meanings and expectations of membership and shared ministry. Childcare is available. Let Laura know by email, phone call, or at church if you would like to attend at Lmcbride010@gmail.com or 989-772-5512. Seriously, Don't Miss This Opportunity! This year we have the opportunity to send a good number of people from UUFCM to the General Assembly (GA), the annual meeting of our Unitarian Universalist Association (UUA). Attendees worship, witness, learn, connect, and make policy for the Association through democratic process. This year the GA 2018 will be held in Kansas City, MO, June 20-24. Attending a General Assembly is an amazing experience! If you’ve never been to a GA, feel free to see other people who have – Laura McBride, Dawn Daniels, Gisela Moffit, Jim and Liz Dealing, Chris Bailey, Mary Alsager and Brigitte Bechtold, and they will confirm! You can also find a great deal of information at uua.org/ga. Just poke around a bit! Because an anonymous donor has given money in support of leadership development to send more people to GA this year, all expenses will be paid (registration, housing and transportation [car]) except for meals. If you are interested, please contact Norma Bailey at 989-560-3952 or at baile1nj@cmich.edu. We must have the final count by this Sunday, April 15. Sign Up Now - Trainings Begin on April 14! The Poor People's Campaign - A National Call for Moral Revival - is set to commence on May 13. Please fill out the online training and organizing form to sign up for an action training session and see the schedule for direct action campaign events. You can also visit the Michigan Campaign's Facebook page for more information. This Sunday a special plate collection will be taken to supplement the minister’s discretionary fund. Our minister is often contacted by people in the community who might need gas money, money to pay an electric bill, a night in a hotel, etc., and she uses her discretionary fund to provide this. While we have a line item in our budget, it does not suffice for the needs like this in the community, which is why we take a special plate collection to supplement the fund. Given that the homeless shelter closes at the end of April, this fund may be especially needed. Checks for this fund should be made out to UUFCM with “Discretionary Fund” indicated in the memo line. Our monthly “Fellowship Life” meeting will be held this coming Sunday immediately following our worship service. This brief meeting is an opportunity for our board of trustees to update the fellowship on current events and/or issues of concern. Please plan to attend! As we work to become a safer congregation, you will be seeing changes to make us safer from fire, tornados, and assailants. Take the time to read the article “Sunday Security”, page 40 in the Spring 2018 issue of our UUWorld. It explains how UUA and individual congregations are becoming more safety proactive. taking care of our church, taking care of our world. Reflections on stewardship continue to be shared in worship services for our fellowship's stewardship season. Aaron Jones, Norma Bailey, Susan Paton, Brigitte Bechtold, and Katie Zapoluch have shared their hearts with us regarding why they come and support our lovely fellowship (click the links to see their reflections). Join us to hear Kevin Daum's message this Sunday. By now you will have received a letter and the proposed budget to help you plan your giving for Stewardship Sunday-Earth Day Festival on April 22, 2018. The complete Stewardship packet is available online and on the counter near the name tags by the end of the month. Pledge and volunteer forms will be joyfully received by Chris Bailey, Treasurer at PO Box 41, Mt Pleasant, MI 48804-0041. You may also give them to Chris Bailey or Laura McBride, Stewardship Chair, at church on Sundays. We are asking that those of you who bring snacks for our coffee hour (thank you so much for your contribution!) no longer bring any nuts or any confection that contains nuts (for example, peanut butter cookies). We have a child with nut allergies, and we already had a scary incident in which she was offered a cookie with nuts which could have been very dangerous. It’s a good thing that there are lots of other kinds of snacks and confections to contribute that we will all enjoy! The UUA Commission on Appraisal invites your participation in a brief survey to help them as they prepare to select our next UUA study topic. Your UU Board has sent in a UUFCM congregational response; as well, they also are seeking input from individual Unitarian Universalists. This is the link if you wish to respond. The Social Justice Coordinating Team encourages members and friends to attend events from CMU’s Pride Month of Events. For more information, visit their Facebook page, or download the flyer. The principal sources of human misery may fairly be said to lie in the over-possession, under-possession, and the unwise use of economic goods.